For sports fans, there wasn’t much to choose from on the Turbo. As was the case with most sports, there was only one baseball game on the system – World Class Baseball. The game tries to sell itself as a baseball simulator but is in reality a very arcade-like experience, with pitches that defy the laws of physics. The game has excellent presentation, and as is the case with so many Turbo games, top-notch chiptunes give it a superb sound. The graphics look good and give the game a level of detail that clearly separates it from sports games from the 8-bit generation. You can choose from among 12 fictional teams with names like the “Apples”, “Fries”, and “Togas”. 4 game modes are available – “Versus Mode” is player vs. player, “Open Mode” is an exhibition game against the computer, “Pennant Mode” is a playoff mode complete with password save system, and “Watch Mode” lets you watch the computer play against itself. 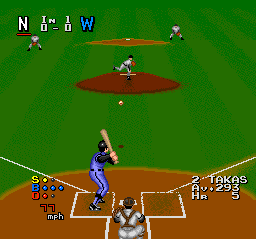 One of the weakest aspects of this game is one that frustrates me with a lot of classic baseball games – fielding. All too often, as the camera follows the ball out of the infield, you have no idea which fielder you’ll be controlling. Move the second baseman towards first to field a ground ball, and you also moved the first baseman off of the bag. Try to catch a runner stealing second and the pitcher will cut off the throw unless you move him out of the way while the ball is in the air. Some games start off bad and then grow on you, World Class Baseball is a bit different – it seems pretty good at first but slowly grows off of you. It isn’t a horrible game by any means, but the more you play it, the more its frustrations come bubbling up to the surface. If this was 1989 and the Turbo was the only system that I owned, I’d be content with World Class Baseball, but with all of the choices that I have on other classic platforms, this one falls through the cracks. Buy World Class Baseball on GameGavel or Amazon. Tagged Baseball, HuCard, hudson, PC Engine, Power League, Review, Sports, turbografx, turbografx-16. Bookmark the permalink.